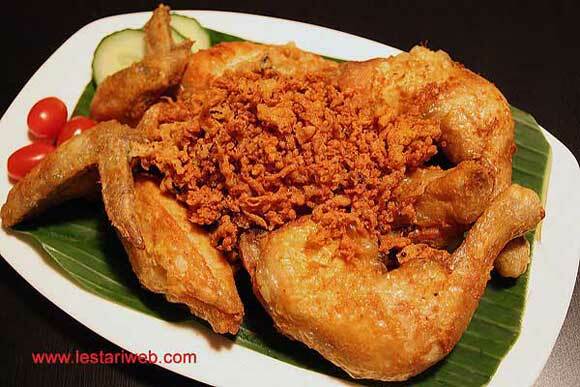 This is one of Indonesian's favourite side-dish : Ayam Goreng Remah. Originated in middle of Java & Jogjakarta regions, they are presented by famous restaurant franchises such as "Ayam Goreng Mbok Berek, Ayam Goreng Nyonya Suharti, Ayam Goreng Wong Solo etc. Each brand/restaurant has their own secret recipe, but the appearance is almost similar. It is a crispy Fried Chicken, buried under a mount of fried crumbles that are made by deep-frying the seasoned batter from the chicken's poaching liquid. Served with hot sambal (chili sauce), lalapan (a selection of raw vegetables such as cabbage, sweet basil leaves including tomato and cucumber) and steamed white rice, Ayam Goreng Remah & Ayam Goreng Kremes is Jogja & Solo "most loved" culinary icon. At the beginning I was also quite desperate to make the crispy crumbled flakes...but after many "try & error" method, I may share you how to make it, so that you can spare the whole nerves ;-) What about the taste?? Hmmm....it's finger licking good ;-) Crispy chicken....crunchy flakes ever!!. Boiling the Chicken: Cut the chicken in serving portions, wash and set aside. Put all ingredients for the paste in a grinding stone/blender or food processor and grind/blend until smooth. (If necessery add a little bit water from the recipe (1 liter) to help the blending process). Transfer the paste mixture into large saucepan. 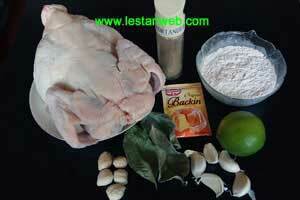 Add the chicken, spice mixture, lime juice, coconut water/ the rest of 1 liter water & salam leaves. *** Simmer over medium heat until the chicken is getting tender & the spice mixture becomes thicker. Take out the chicken, set aside & keep the left over spice mixture. Making the Batter: Measure the spice mixture in a glass scale for 300 ml/ 10 fl.oz. ( if necessary add water to top-up). Let it cool. Mix the rice flour, tapioca/corn flour & baking soda evenly. Add 200 cold water & mix well. Add the 300 ml left-over spice mixture which you've kept aside before to the flour mixture. Stir to mix. Adjust the seasoning, add salt if necessary. ( A bit salty is better than it tastes bland after frying). Frying the chicken: Heat enough oil in a large frying pan & with fingers, gently rub the mixture to cover each piece of chicken. Deep-fry the chicken over hot oil until crispy golden-brown. Set aside to drain. (If preferred deep-fry the chicken in a Fritteuse to 375°F (190°C) for about 4-5 minutes). Discard the remain flakes from the frying pan. Frying the crunchy flakes: Re-heat the oil on high heat, add more oil if necessary. (Oil should achieve it's maximum heat before frying). Scoup 1 tbsp left-over batter at a time, pour and spread the batter evenly on the oil surface with the left hand, wait a second then shake the flakes with your right hand using a wooden spoon. (By shaking you also break in pieces to get grainy texture (not one cracker form) as required for this recipe). Do not add too much batter at once otherwise you get a big ball instead of flakes....from own experince ;-( . The flakes is done when it floats on the oil surface & has golden-brown colour. Set aside to drain or put over kitchen paper to let the oil absorbed. (Press & break the fried flakes with frying spoon if necessary). Sprinkle the flakes over the fried chicken & serve. Choose the young chicken to obtain the best taste. *** Cook the chicken slowly over medium heat to ensure the spice mixture is well absorbed to get a better taste. The flour flakes will be soften & limb eventually. That's why it is advised to make the flakes shortly before serving. Or you can fry it in advance, let it cool & store in air-tight container & cover tightly. From my own experince, with this way the flakes will stay crunchy until 3 days later.